Those awaiting results of November 2015 Civil Engineer (CE) board exam can find here the alphabetical list of passers, top 10 (topnotchers), top performing school and performance of schools as the Professional Regulation Commission (PRC) and the Board of Civil Engineering released results in 2 working days after the last days of exam. The Board of Civil Engineering headed by Engr. Praxedes P. Bernardo with Engr. Pericles P. Dakay and Engr. Romeo A. Estañero, Members administered the Civil Engineer board examinations on Wednesday and Thursday, November 18 and 19, 2015 in Manila, Baguio, Cagayan de Oro, Cebu, Davao, Iloilo, Legaspi, Lucena and Tacloban. 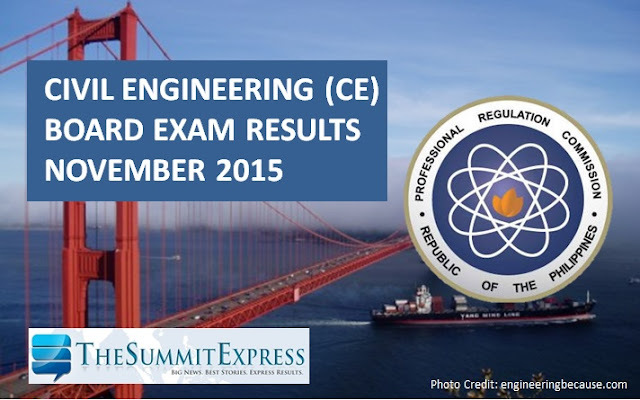 CE board exams cover the following major subjects: mathematics, surveying and transportation engineering, hydraulics and geotechnical engineering (November 18) and structural engineering and construction (November 19). According to PRC, target release of Civil Engineering board exam results is on Wednesday, November 24, 2015 or in 2 working days after the exam. Note that work in the public sector (including PRC) has been suspended on November 20 (Friday) due to the APEC Summit. In December 2014, results were announced online in 3 working days. PRC named a total of 4,021 out of 8,127 new civil engineers who hurdled the exams. In May this year, results also out in 3 working days. 1,361 out of 4,311 takers passed the tests.